WaldrichSiegen horizontal turning lathes, ProfiTurn H, for turn-milling provide the highest accuracies, reliability and performance. With the integration of a milling unit with a performance of up to 50 kW into the upper carriage you are ensured high quality and economic machining of complex workpieces in one set-up. Great importance is attached to a rugged design and maximum stiffness of the overall machine structure. In principle, ProfiTurn H series is equipped with hydrostatic guideways in all linear axes providing for high wear-free operation along with excellent damping characteristics. 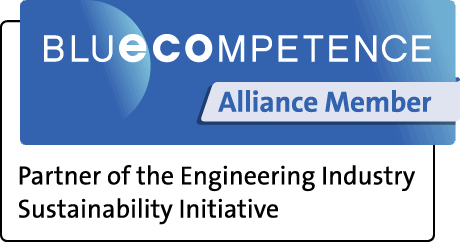 During construction of the machine, life cycle costs have been consistently taken into account. ProfiTurn H turn-milling machines are easy to maintain, energy efficient and impress with the utmost durability. Therefore, investment costs quickly pay off. Highest precision in turn-milling operations is achieved by extreme stiffness of the machine structure. Therefore, ProfiTurn H machines feature a very rigid design. All major components are made of cast iron and are manufactured in-house with the highest tolerances. The guideways of the machine are consistently hydrostatic in order to guarantee the accuracies, the reliability, and the long life-time WaldrichSiegen machines are known for. A milling unit pivoting by 95° has been integrated into the carriage in order to ensure both turning and milling operations with ProfiTurn H. Rough machining and finish machining can be carried out on one single machine. The ProfiTurn H machines feature maximum flexibility and a high degree of process integration. WaldrichSiegen machine beds – made of cast iron – are available in one-section or two-section design. Their ribbed structure ensures maximum bending and torsional stiffness, as well as, an optimal load introduction into the foundation. Precise guidance of the bed slide and exact positioning of steadies, tailstock and peripheral equipment are completely guaranteed as well. The headstock design is crucial for the achievement of the highest run-out accuracies and maximum performance. Therefore, it is cast in one piece and additionally ribbed. The axial and radial bearing placed close to the faceplate provides for the highest precision. Made of cast iron, the faceplate can accommodate workpiece weights of up to 500 tons. 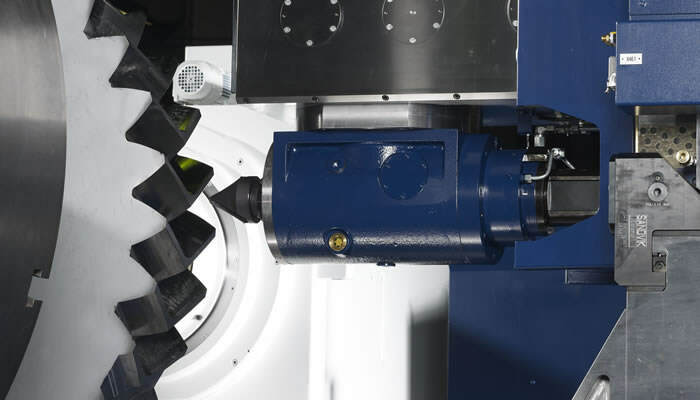 Recent drive systems, like the Master-Slave-drive, for example, enable the optimal machining of workpieces with the highest precision and performance. Either a hydrostatic worm or electrically pre-loaded Master-Slave double drives are used for longitudinal drive. Traverse adjustment of the upper carriage is carried out via a pre-loaded ballscrew. With the extremely high dynamic stiffness of the hydrostatic worms which applies particularly for heavy duty cutting machines, WaldrichSiegen sets new standards in the market. 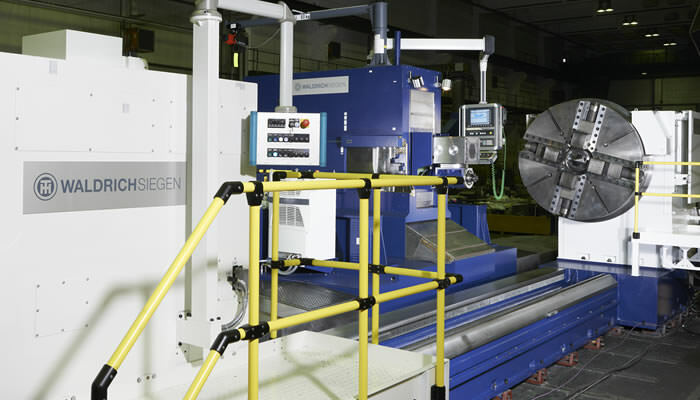 WaldrichSiegen turning lathes meet the requirements for the highest stiffness and accuracy of an optimized upper carriage made of cast iron which can be adapted to the respective machining tasks. A suitable combination of tool carriers in different widths allows the machine to be adjusted to each customers request. Also, the tailstock is a closed one-piece construction made of ribbed cast iron. Well dimensioned, anti-friction bearings accommodate the center shaft resp. the quill in order to achieve excellent run-out accuracies. The tailstock systems are designed for workpiece weights of up to 500 tons. The latest state-of-the-art control technology, made by well-known manufacturers, ensures maximum reliability and user friendliness. 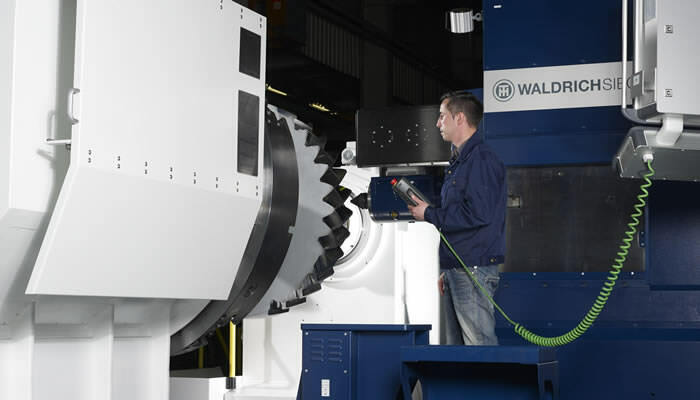 The integrated diagnostic system, developed by WaldrichSiegen, monitors all relevant machine parameters, thus keeping the machine operators permanently informed on the current machine status and helping them maintain downtime to a minimum. ProfiTurn H machines are optionally equipped with a large number of process-optimizing solutions in order to further reduce machining times of complex workpieces and achieve the highest machining quality. 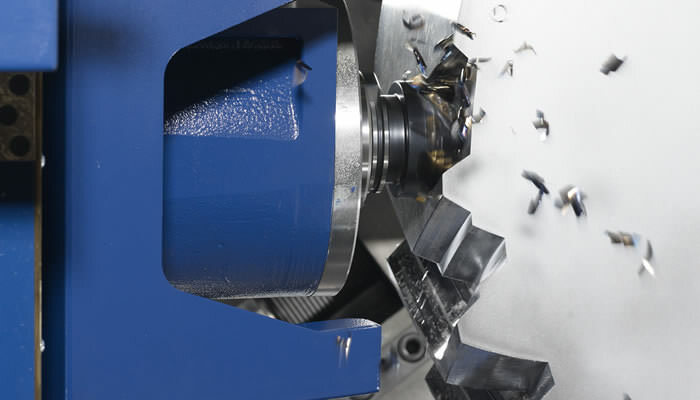 The use of a pivoting tool holder for turning mould cavities into generator rotors significantly simplifies the procedure and even provides for a maximum degree of automation. As a result, process stability is increased and machining times are considerably reduced. 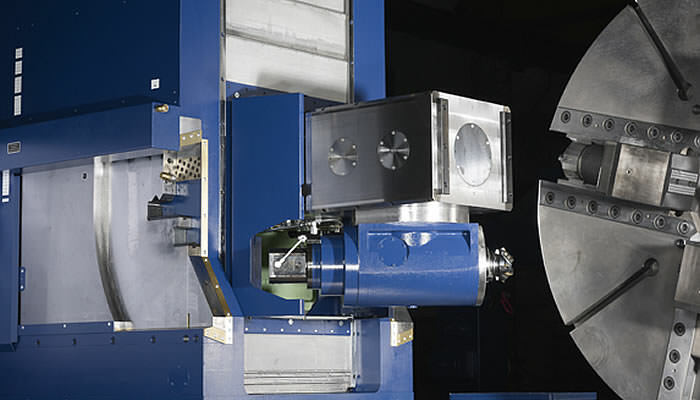 The Dual cutting device – an attachment with numerically adjustable tool carriers – allows for simultaneous and precise machining of symmetric turbine rotor disks with fir tree profiles. The Box-type tool holder allows for presetting a number of tools prior to the machining process which can later be loaded semi-automatically into the upper carriage. Thus, groove patterns can be finish-machined in one single cut. 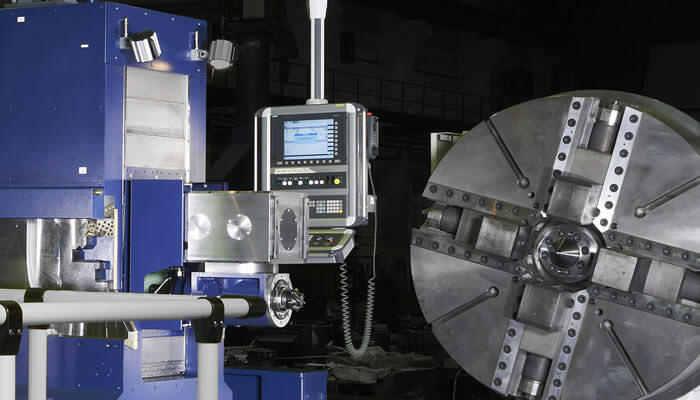 Our solutions range from simple, manually adjustable roller steadies for applications in forges, to complex numerically controlled combination steadies for high-precision tasks, as for example the machining of rotors. Our ProfiTurn H turn-milling machines have been developed with the maximum performance for each application.